Data from van der Zanden, E.H., Verburg, P.H and Mücher, C.A. (2013). Modelling the spatial distribution of linear landscape elements in Europe. Ecological Indicators. 27: 125-136. Download zipfiles: Ditches, GreenLines and GrassMargins. 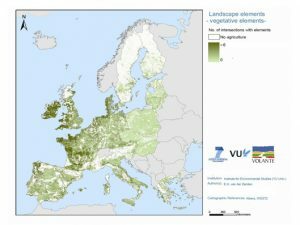 Maps of full European cover are available for green lines (green vegetative elements), ditches and grass margins. These maps are based on a spatial modeling approach using ground observations on linear features from the 2009 LUCAS (Land Use/Cover area Frame Statistical Survey, www.lucas-europa.info) database. 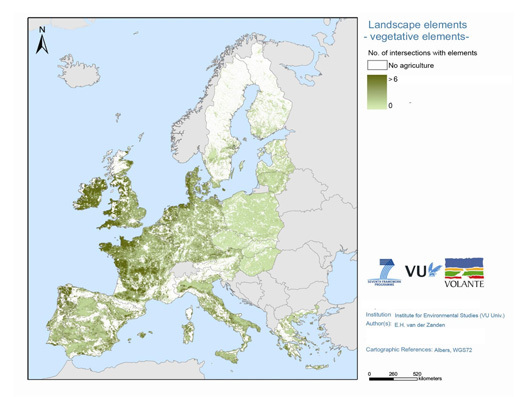 The information on linear landscape elements is based on the ground observations on linear features from the 2009 LUCAS (Land Use/Cover area Frame Statistical Survey, www.lucas-europa.info) database. The 2009 LUCAS dataset consists of 235,000 points, with 250 meter east-west transects recorded at each surveyed location. Transect information is collected by a surveyor walking along a 250 meter long transect and reporting the sequence of land-cover types and counting the crossings with linear landscape features. Only features that are wider than 1m and that are at least 20m long are reported. Within the 2009 LUCAS dataset, information on 19 classes of linear landscape elements was collected. In this study, three classes of linear elements were distinguished, namely, (1) green lines, (2) ditches and (3) grass margins. The selection and aggregation of these classes was based on an analysis of the abundance within the dataset, the original function of the elements within the agricultural landscape and the strong influence of linear elements on agro-biodiversity. In the interpolation approach, the counted linear elements were modeled using zero-inflated negative binomial regression (ZINB) and a set of environmental and socio-economic location factors. These included several socio-economic factors (e.g. GDP, population density), policy areas (e.g. Natura 2000 sites, Less Favoured Areas) and biophysical factors (e.g. soil depth, DEM and land use). The regression models were fitted independently for separate regions: Scandinavia (excl. Denmark), Western Europe (incl. Denmark), Eastern Europe and Southern Europe. In order to use an independent dataset for validation of the results, 150 sampling squares of 10 km x 10 km were randomly generated in agricultural and mosaic land cover areas. Within these sampling squares, 10 Eastward transects of 250m were analyzed using aerial images from Google Earth, according to the LUCAS sampling procedures. As validation, a comparison was made between the average element count per sampling square and the average model outcomes for the same area. An average of 10 transects was used instead of individual transects in order to produce a regionally representative value rather than a local value as we want to judge the map quality based on its representation of regional differences. The validation was restricted to green lines because of the problematic detection of grass margins and ditches from aerial photographs. The dataset has a spatial resolution of 1km2 for EU-27 (minus Bulgaria and Romania).